MerchantCircle | Blog: Fight Night 3: MerchantCircle vs. Roy Jones Jr. So recently at work we've been playing this game called Fight Night 3 on Play Station 2 (management's holding back on a PS3 or a wii, but we won't complain). Fortunately, our morale is great thanks to a number of recent mentions in the media about us. We've worked hard to make sure a business owner can easily navigate their way and manage their reputation on the web. And after 90,000 merchants signed on - it's great to know business owners realize the importance of having a presence on the web. Just this last week, we've graced the sites of BusinessWeek, MSNBC, and USA TODAY, but just as importantly we've reached the analyst and players in the 'local' internet space with The Local Onliner and ScreenWerks. Perhaps the proudest accomplishment for us, is hitting home to people who actually run local businesses including Steve Mun, a real estate agent in Saratoga, CA, and marketing experts like Andy Beal. You can even hear our co-founder Wayne Yamamoto in The Startup Studio podcast this week. All of the attention is great, but it means nothing if our merchants don't get new customers. And they are! Take for instance Beyond Atioxidant, Dodd Priority, or All American Gutter. 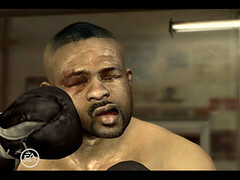 With merchants like that in our corner, MerchantCircle can take out all comers - even Roy Jones Jr.